1969 Topps Baseball is best known for Mr. October's rookie card. 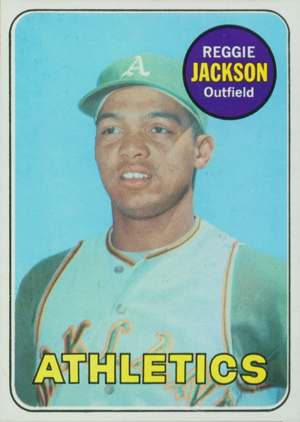 While the Reggie Jackson card is the clear favorite, the vintage set is also notable for Rollie Fingers' rookie and the final active issue for Mickey Mantle. 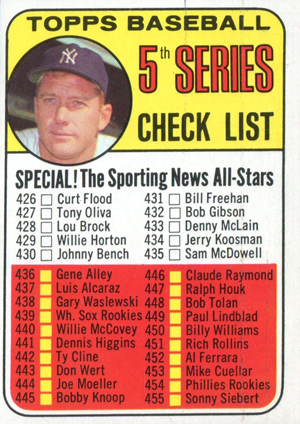 Upon release, the 664-card 1969 Topps Baseball checklist was the largest in the history of the sport. 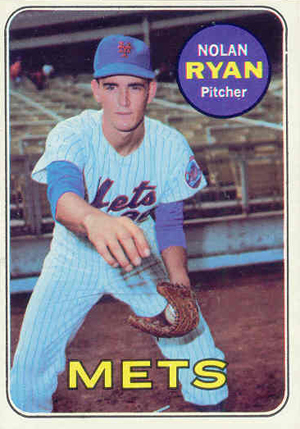 Although the sheer quantity is enough to make it stand out, '69 Topps' strong popularity is due to the many Hall of Fame names in the checklist, including Nolan Ryan's first single-player Topps card. 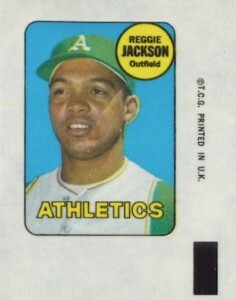 Shop for 1969 Topps Baseball cards on eBay. 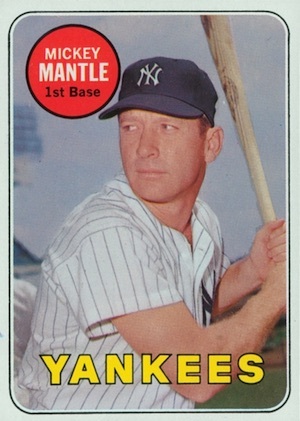 Very similar in overall design to the set from the previous year, 1969 Topps Baseball replaces the speckled border area with a traditional white. The design is not amazing, but features a much better look than 1968. The rounded border remains from the previous year. The team nickname is noted in block letters at the bottom of the card and a colored circle at the top of the card includes the player's name and position. As had been done previously, specific color combos were each used for a pair of teams. For example, the base cards for the Montreal Expos and Kansas City Royals, two of the newest MLB expansion teams, feature black print on a pink background. The other two new teams, the San Diego Padres and Seattle Pilots, showcase yellow print on a brown background. 1969 Topps Baseball backs return to the horizontal layout and feature a peach/pinkish background. Most cards also contain a short paragraph and cartoon. Again documenting season-by-season stats for each player, the more limited card length due to the layout means that some cards have a very tight fit. In instances of seasoned players, like Mantle above, the cartoon is removed. 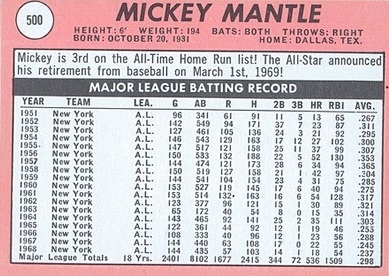 Largely similar through much of the era, 1969 Topps Baseball features several subsets. Starting things off, League Leaders (#1-12) note the top performers from the previous season. World Series Highlights (#162-169) cover the title matchup between the Detroit Tigers and St. Louis Cardinals. 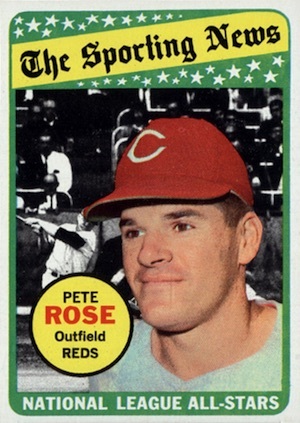 The Sporting News All-Stars (#416-435) are also found in '69 Topps and backs combine to form two photos, including Pete Rose and Carl Yastrzemski. While checklists are also available, collectors won't find team cards in the final flagship release of the 1960s. Again, the majority of RCs are found on the Rookie Stars combos that generally feature two or three first-year players from specific teams. 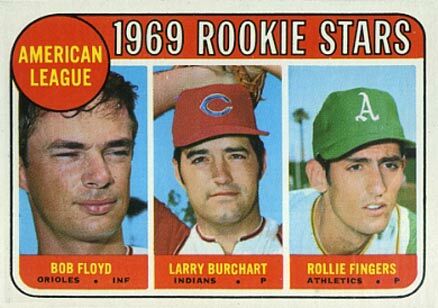 In addition to the key rookie cards for Reggie Jackson and Rollie Fingers, 1969 Topps Baseball is also the place to find rookie cards for Craig Nettles (#99), Bobby Cox (#237) and Bobby Bonds (#630). 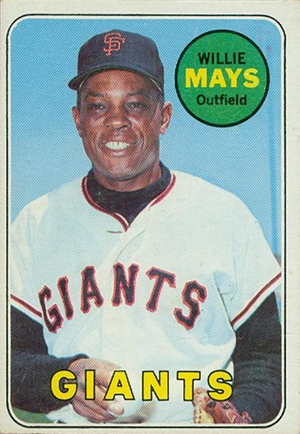 Multiple variations bring the 1969 Topps Baseball master set count to just under 700 total cards, making the large set even more of a challenge to complete. Mostly related to the letter color for the player's name, the variation cards carry a premium. White-letter variations for Willie McCovey, Gaylord Perry and Mickey Mantle are among the most notable. 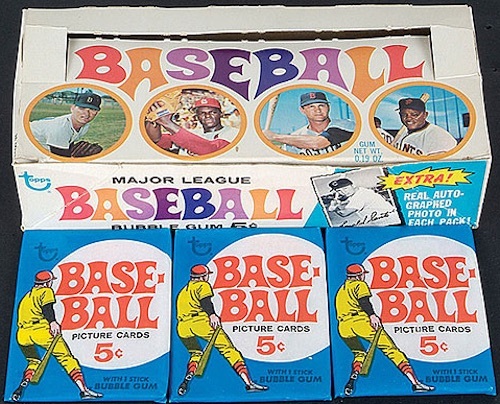 Originally distributed in wax packs, rack packs and cellos, a bonus blue cello pack with ten cards was also produced for the 1969 Topps Baseball set. The set was again released in a total of seven series, but the high-number cards were issued even later in the year. As a result, these cards are much more scarce and expensive. 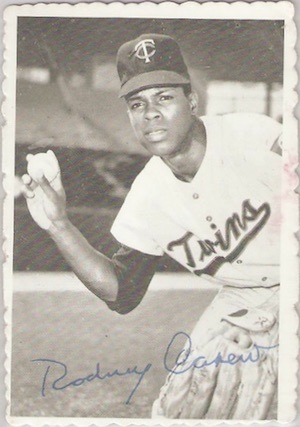 While the huge checklist is more that enough for most collectors, 1969 Topps Baseball also included two popular inserts in the form of Decals and Deckle Edge. Topps Decals measure 1-3/4" x 2-1/8" and are not easy to find in high grade because of the intended usage as stickers. Deckle Edge inserts are just slightly smaller that traditional cards and showcase a black-and-white photo. The real noticeable attribute is the die-cut edge, which makes the cards very difficult to find in mint condition. The cards also feature a blue facsimile signature. Common condition issues for the set are primarily centering. However, many cards also suffer from blemishes and ink dots that occurred during the printing process. Lou Brock and Tom Seaver appear to be some of the toughest to find in high-grade. 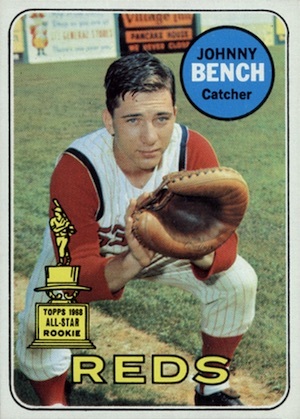 In addition to being released in the United States, 1969 Topps Baseball was marketed in Canada under the O-Pee-Chee brand name. The set is almost identical to the American issue except for a few differences. 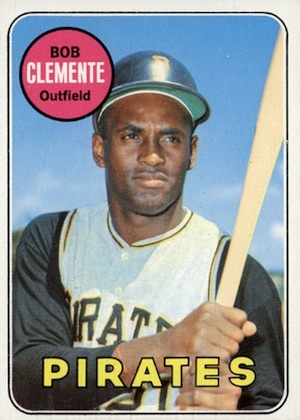 The most obvious thing to note is that 1969 O-Pee-Chee Baseball card backs feature "PTD. IN CANADA" instead of the "PRINTED IN U.S.A." found on the American version of the cards. Another difference is that the Canadian version does not include Topps logo that can be found surrounding the card number on the backs of the US cards. The OPC set only features the first 218 cards from the main set. 1969 Topps Mickey Mantle #500A - BVG 7.5 NEAR MINT+! A RARE BEAUTY! PRICE DROP!! 664 cards. Shop for base sets on eBay. Short prints (SP) and double prints (DP) are noted below. 162 World Series Game 1 - Gibson Fans 17; Sets New Record! 99 Twins Rookies - Danny Morris / Graig Nettles - black loop above "Twins"
48 cards. The cards are not numbered and are listed in alphabetical order by last name. 35 cards. Two numbers (#11,22) are each used for two players. 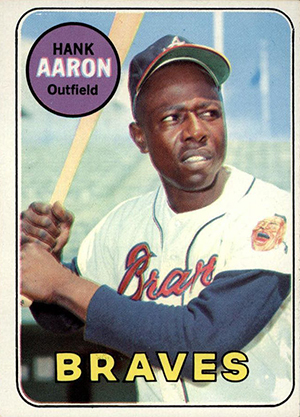 The 1969 Topps set is probably the easiest set of the 1960’s to complete, with no high number series (like in the other Topps sets from the 1950’s and 1960’s) to go after. 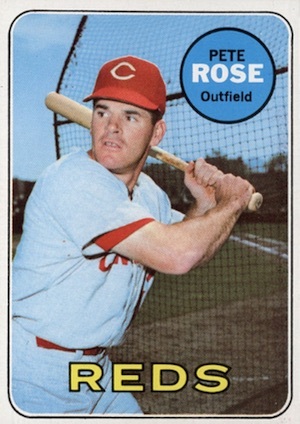 Fortunately, I completed the basic 1969 set in the early 1980’s, at a time when old baseball cards were a lot cheaper back then, I eventually added the variation cards of Donn Clendenon and Clay Dalrymple years later. It is a very nice set. The 69 set continues to be one of the easiest sets to put together and with the errors and variations still available, you can successfully complete this set without having to sell your car to do so. There are less than 10 high dollar cards in this set. I put this set together with middle grade cards and then started the process of upgrading which has taken a couple of years, but it has been an enjoyable process. This set brought me back to collecting after being away for several years. Completing a high grade set can be a challenge but doable (and fun).